On his inauguration, President Obama will be protected by the Secret Service, 11,500 Soldiers, and 4,000 Police Officers. They have armor and automatic weapons. No one is assigned to protect my family. 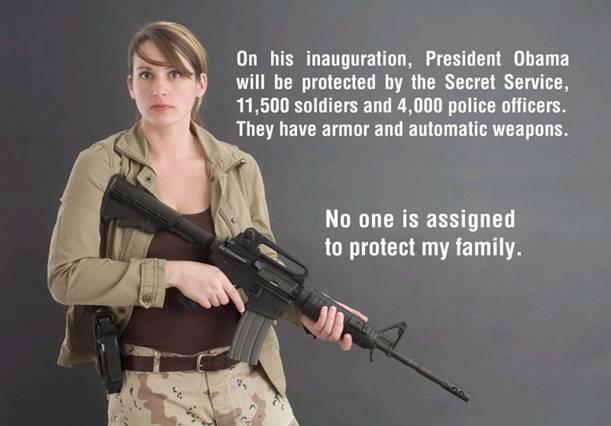 And every other president has had the same protection so whats the big deal? Your family doesn't get an unprecedented number of threats against their lives from right wing a-holes either! No but he will band guns if he gats the chance, Imagine being robbed, or your house being broke in to an they have band guns. you think that robber who is breaking the law away want have a gun your crazy. So i say everyone should have a gun an be trained to use it, have you ever heard of a cop getting robbed no he has a gun. Have you ever heard of a crazy gunman at firing range no because the people there have guns, I know this is hard to understand for most but guns are not bad people are. Take away guns and they will make bombs, use bats, knives, any hard metal object. Come on people really it takes cops on the average 10mins to arrive, it takes a second to shoot or kill a nother way, and by the way an AR-15 is not a fully auto weapon even though it looks like a M-16 it is not. It is semi-auto just like a cops pistol. Wake up people. hope this helps lefties LOL. 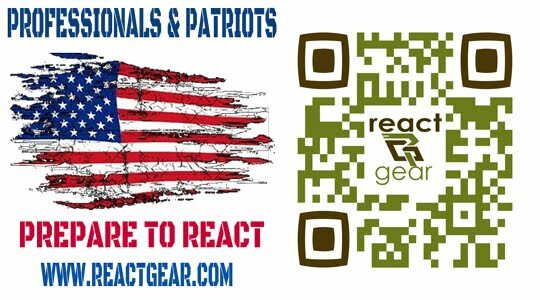 Any one who agree with left are far lefts are called right wing, so i just payed you back. by the way Anonymous I put my name have a good New Year an God bless. I serve my God, Country, an Community. I am a Guardsman,MP,an Fireman. I deal with the bad guys, so take it from me. An Im not a blogger by the way, so dont look to see me on other blogs I just had to speak my mind its a right you know, just like the right to bear arm. God Bless, you all an these United States of America. We dont say these any more I wonder why? Did you see the video of a women shooting and killing her son, at a firing range? because he advocates gun control. i dont care if he gets threats if i feel threatened i want to protect myself.